The National Thoroughbred Racing Association, Daily Racing Form, and the National Turf Writers and Broadcasters announced that HRTV (R), The Network for Horse Sports, will again provide live coverage of the 43rd annual Eclipse Awards on Saturday, January 18th, 2014. The event-day television coverage of the Eclipse Awards, to be held at Gulfstream Park Racing and Casino in Hallandale Beach, FL, will air from 8-11 EST (5-8 p.m. PST) on Jan. 18. HRTV will also offer a half-hour Eclipse Awards recap show, hosted by Scott Hazelton, beginning at 11 p.m. EST. Additionally, HRTV will offer on-site interviews during its “Grandstand” show on Saturday, beginning at 4 p.m. EST. Live coverage of the ceremony will also be available via Racetrack Television Network (RTN), DRF.com and HRTV.com. For the third consecutive year, Jeannine Edwards of ESPN will host the ceremony. The Eclipse Awards are presented by Daily Racing Form, Breeders’ Cup and The Stronach Group and produced by the NTRA. The awards, named after the great 18th-century racehorse and foundation sire Eclipse, are bestowed upon horses and individuals whose outstanding achievements have earned them the title of champion in their respective categories. Voting takes place among designated representatives of the NTRA, DRF, and the National Turf Writers and Broadcasters. Awards also are given to recognize members of the media for outstanding coverage of Thoroughbred racing. 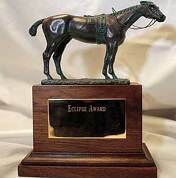 The Eclipse Awards are the Oscars of horse racing. In addition to honoring the 17 winners in the horse and human categories, Hall of Fame trainer D. Wayne Lukas will receive the Eclipse Award of Merit and the Thoroughbred Aftercare Alliance will be recognized with an Eclipse Special Award. Jim Benes will receive an Eclipse Award as the Handicapper of the Year. Members of the media will be honored for outstanding coverage in six categories.